SIG Pro-Balancer Serious Equipment for Serious Modelers! Balance! The wrong center of gravity (especially tail heavy), will turn your model from an eagle into a turkey. Just a fraction of an inch change in balance point can make the difference between a solid performer and an airplane you have to fight just to get back down in one piece. Even if you only fly pre-built ARF models, don't overlook this critical step. Balsa wood is a natural product and the weight of the wood can vary. Together with the differences in engine and radio selection, your new ARF model may be far out of balance and needs to be checked. An out of balance propeller is often the cause of poor engine performance, poor fuel flow (caused by engine foaming), and even radio problems due to excess engine vibration. With the SIG PRO-BALANCER, you can quickly balance your model and propellers from one simple device. 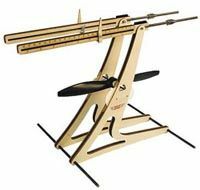 The Pro-Balancer will handle nearly every model in your fleet (fuselage widths up to 11 in (28 cm) and any size model propeller. The Pro-Balancer uses carbon steel, laser cut SIG plywood and is equipped with ball bearings so it will last for years.